Manoj S. Abraham spent the first 20 years of his professional life as a ‘techie’ - managing products and marketing initiatives for software companies. That started to change in 2011 when his first child born. From that point on, he began embracing what was once a hobby - writing - as a career. That same year, he launched Surfacing - a blog that showcased a collection of writing styles, from poetry to anecdotes about fatherhood. 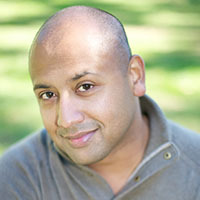 In December 2012, Manoj self-published his first book, Sam’s Three What-Ifs. The book was written to be a tool to teach children some old-fashioned values that seem to be disappearing from American society today. Reaction to the book was overwhelmingly positive. Manoj started 2013 by thrilling his adult fans with the release of the first episode of Soul Crossing - a free ongoing novel available exclusively on his blog. In 2015, Manoj released his latest project, a new children's book entitled Where the Tomorrows Go. The book addresses the sensitive topic of loss in a manner that small children can understand. Manoj credits his interest in writing to his father, who encouraged him to take on writing and editing projects from a young age. He currently lives in New Jersey with his wife, Kristen, children, Sam and Maya, and their dog, Sherpa.